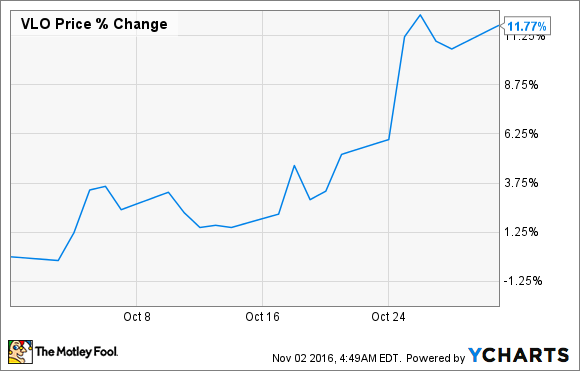 Shares of oil refiner Valero Energy (NYSE:VLO) jumped 11% in October. While the stock slowly gained ground all month, a large portion of those gains came from the company's third quarter earnings that soundly beat estimates. Valero's third quarter earnings on a normalized basis came in at $1.24 per share, which handily beat analyst expectations of $0.93 for the quarter. The company was able to beat expectations by increasing its crude oil throughput at its refineries as well as lowering its per barrel operating costs. These helped to offset the large declines in refining margins as well as the rising cost of compliance with the U.S. EPA's Renewable Fuel Standards. Also helping with that stock price surge was the announcement that the board of directors has approved another $2.5 billion in stock repurchases. In the past 5 years, the company has reduced its overall share count by 17.9% thanks to these large share repurchase programs. With close to $6 billion in cash on the books, Valero doesn't run much risk of a cash crush with this program. Even though the company's stock surged last month, it is still down about 16% in 2016 and currently trades at a very reasonable price to tangible book value of 1.4 times. With the ability to post decent results in a much weaker refining market and boost shareholder returns with share buybacks and a dividend yield of 4%, shares of Valero look rather attractive.